This is going to be trouble. When I spotted these flatbreads a few weeks ago on the blog Marcellina in Cucina, they immediately reminded me of what’s heaped in a basket at you sit down to eat at Cafe Fiorello, a New York City restaurant across the street from Lincoln Center. I’ve munched on that basket of flatbreads dozens of times over the years before heading to the opera or ballet but never managed to make them at home. Not that I tried.. until now. And as I write this, having eaten four of these flatbreads in a row, (one with a fresh avocado smeared over it) I’m wondering whether finding this recipe was such a good thing. They’re seriously addictive. If I don’t stash the rest of them in a tin far from my sight, I may scarf down the rest before I finish writing this. That would be a shame, not because they’re laden with calories, but because they’re the perfect thing for sharing with friends over a glass of wine. They’re not hard to make either, even for those of you who are yeast-averse. They just take a while to bake because there are so many of them and your oven can only hold a couple of baking sheets at a time. 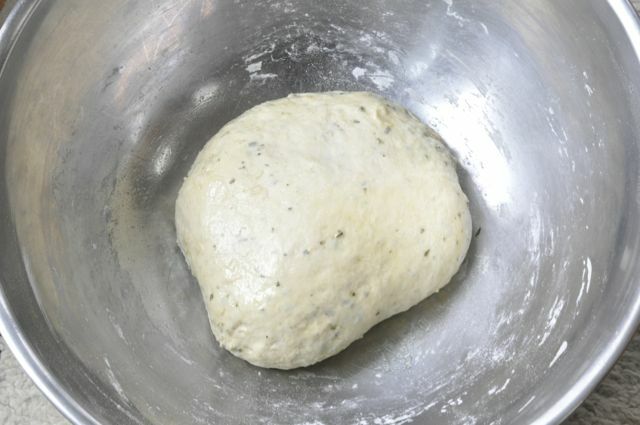 I mixed the minced rosemary right into the dough, rather than sprinkle it only on top before baking. After the dough has risen for an hour or so, separate it into 16 pieces. 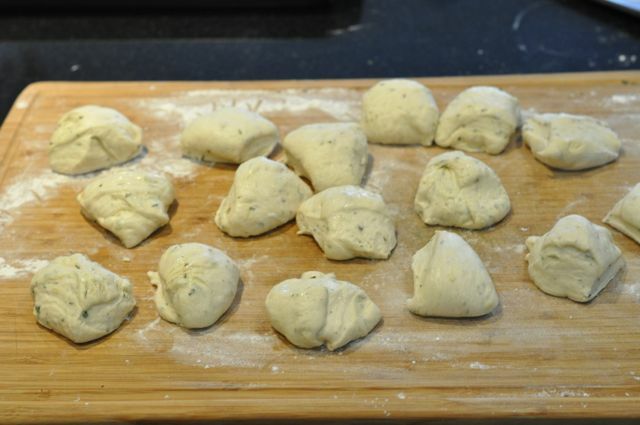 Then roll them out and don’t worry if they’re misshapen or larger or smaller than the recipe calls for. Brush with egg yolk and sprinkle with sea salt. For some, I used a fleur de sel. For others, I used a homemade dried herbs and sea salt combination. You can experiment and use any herbs and/or spices you like. 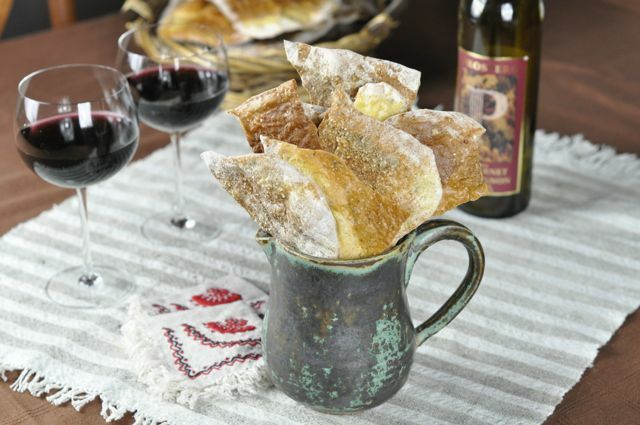 They look attractive in a basket, but they’re large, so you’ll want to break them into smaller pieces for serving. Drinks not included. 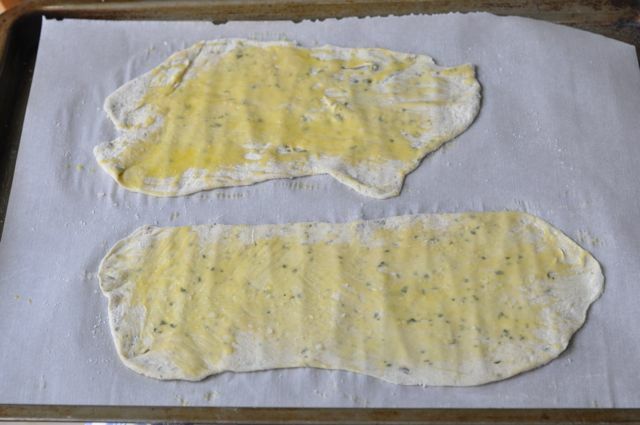 For another take on these flatbreads, take a look at Antonietta’s version of Fiorello’s flatbreads at her blog Cipolli. teaspoons coarse salt, and the sugar. Stir until a dough forms. Add the minced rosemary. They look really tempting! 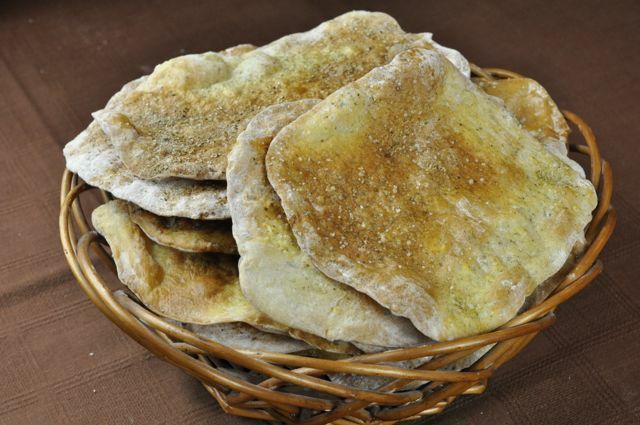 A fragrant treat… Flatbreads are great. I love rosemary and the scent which gives the food! your bread is wonderful Linda! This is just the kind of snack I like to munch on with a cocktail or a glass of wine. I'll take a savory treat over a sweet one any day. Your homemade version must be delicious. No kidding this is going to be trouble! Those look great. I could make a meal out of them, most certainly! I like your variation of adding the rosemary to the dough. That way its perfume will infuse the entire flatbread and there is less risk of the rosemary singeing in the heat of the oven. 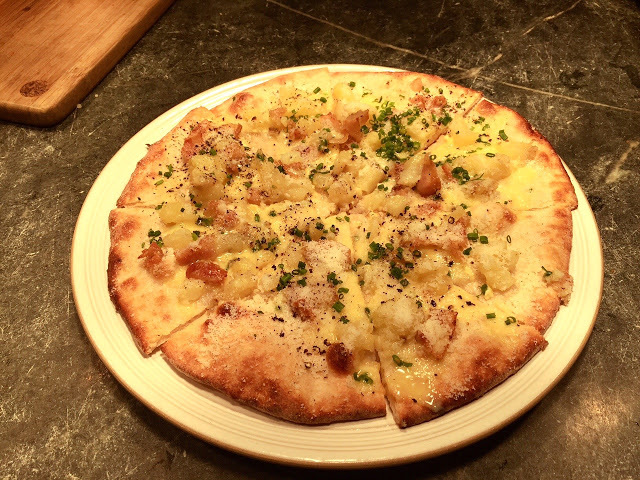 As for the calories, well once diners get started with the lardo, it's all over anyway! These look geat. It is only 10:00 here now, but I want this. Thanks! Flatbread is so wonderful and tasty! I love your addition of rosemary! I've munched on Fiorello's flatbreads quite a lot over the years. A downfall but a great love. So now, I can make these at home? Thanks a lot! Now I'll be making these at home. A lot. Hi my name is Marie, I'm yeast-averse! For so long I wanted to make flatbread, always looking for a recipe without yeast. I think Mario B has one, but now I will take your word and try to make these. I can't wait they look addictive, I know already I'm going to be in trouble! 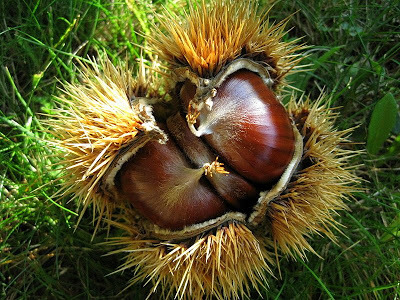 sono ottime per accompagnare qualunque cibo! buon we cara Linda, un abbraccio ! These sound wonderful and a delicious addiction. Not a real fan of Rosemary…I may use a little french tarragon. I just had to bookmark this recipe. Thanks Linda. I love flat bread! I have to bookmark this recipe and make it. Thanks for sharing Linda! When delicious breads such as these rosemary flatbreads are presented at the table, I eat so many that I can't finish the main entree'! Addictive is a perfect way to describe them! Love the addition of rosemary too! These look incredible! I'm not sure I'd be up to make them myself. I'm feeling pretty lazy about cooking these days with a heavy load at the office—but perhaps you could FedEx a few down my way… ? Yes, these flatbreads are amazingly addictive. I have made them over and over again. No more buying crackers for us. Yours looks fabulous! I'm glad you enjoyed them! Oh, oh! This is a dangerous recipe as I also loved those flatbreads at Cafe Fiorello! I could eat the entire batch, Linda. I will have to make these when I have company so I will have to share them..lol! Thanks for sharing this recipe! Sigh…I aure wish I had some of these right now for my nduja. The recipe does sound easy so I could get cracking. Love the free-form shapes. And spread with avocado puts it over the top. A good addiction for sure.